A sacred fire burned in Kildare reaching back into pre-Christian times. Scholars suggest that priestesses used to gather on the hill of Kildare to tend their ritual fires while invoking a goddess named Brigid to protect their herds and to provide a fruitful harvest. When Brigid built her monastery and church in Kildare she continued the custom of keeping the fire alight. For her and her nuns the fire represented the new light of Christianity, which reached Irish shores early in the fifth century. In Brigid’s time, the number of her nuns who tended the flame was nineteen. On the 20th day, Brigid tended it herself. The sacred flame survived possibly up to the suppression of the monasteries in the sixteenth century. In 1993 the flame was re-lit in the Market Square, Kildare, by Sr. Mary Teresa Cullen, then congregational leader of the Brigidine Sisters. Kildare County Council commissioned a sculpture to house the flame in Kildare Town Square in 2005. President of Ireland, Mary McAleese, presided at the lighting of the Perpetual Flame in the Town Square on St. Brigid’s Day 2006. 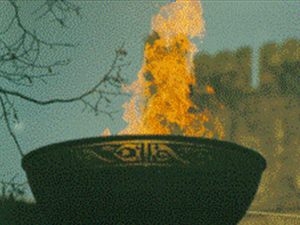 This flame was lit from the flame tended by the Brigidine Sisters in Solas Bhride. The Brigid Light is still guarded and tended in Solas Bhride as it was in Kildare many centuries ago by the Sisters of St Brigid. The flame burns as a beacon of hope, justice and peace for Ireland and our world. Kildare Fire Temple. Right – Brigid’s Light at Solas Bhride.